Shirataki Noodles a Miracle Food? In Asia they have long enjoyed a type of pasta made from the konjac root. Big deal, right? Pasta is pasta. Not true of this particular pasta. Shirataki or hiragana noodles have only 3 grams of carbohydrates but 1 gram of lean protein and just 20 calories in a 4 ounce serving. Most Americans have heard of them thanks to Rocco DiSirito’s recent appearance on the Rachael Ray Show. 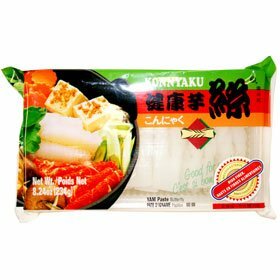 Shirataki noodles are mostly water and glucomannan (from the konjac root), a water-soluble dietary fiber. Though they have little flavor of their own, they easily absorb the flavor of whatever they are served with. Their are some varieties that include tofu, this slightly increases the protein. More importantly it makes the texture more tender. The tofu-less variety tends to have a rubbery texture that may seem odd to the Western palate. 1. Coat the bottom of a saucepan lightly with canola oil and place it on medium heat. Add the garlic and ginger, along with a pinch of salt and pepper. Cook until softened, about 3 minutes. 2. Add the lime juice, soy sauce, and sugar. Bring to a simmer and let the mixture reduce by a third to a syrup consistency, 8 to 10 minutes. To check consistency, pour a line of syrup on a cool dish and hold it vertically. If the line holds with a few drips, it’s ready. The Men’s Health piece features more information and recipes for this amazing pasta. Entry filed under: Food and Cooking. Tags: asian, blue ginger, cheflebrity, East Meets West, glucomannan, hiragana, konjac root, lu lu lemon, Men's Health, Ming Tsai, miracle noodles, noodles, pasta, rachael ray, Rachael Ray Show, Rocco Dispirito, Shirataki, shirataki noodles where to buy, simply ming, Soy Pork Shirataki Stir-Fry, tvp recipes. Thanks! I’ll bookmark this and try it out sometime soon.